Moon represents a fine balance of Japanese perfectionism and aesthetic simplicity. Ancient poetics and modern styling. The armchair version is produced by rotational moulding, in polyethylene or nylon lacquered in white, pearl grey and black or made in fabric-upholstered polyurethane. 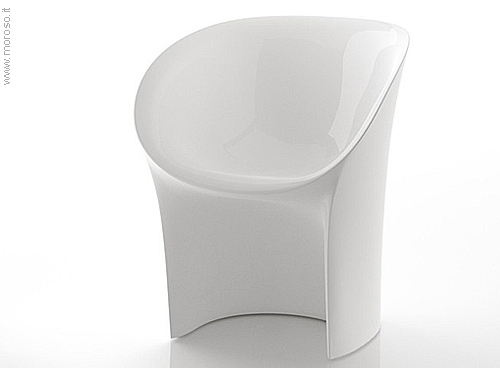 The chair, with steel feet, is also available in a lacquered flexible polyurethane version. Has this chair been tested by people like myself whose legs aren't what they used to be. Getting onto a chair may mean a rather heavy, if not violent, thump. Getting up from one requires considerable force on the front of the chair's arms. Visually, this chair doesn't suggest sufficient stability.